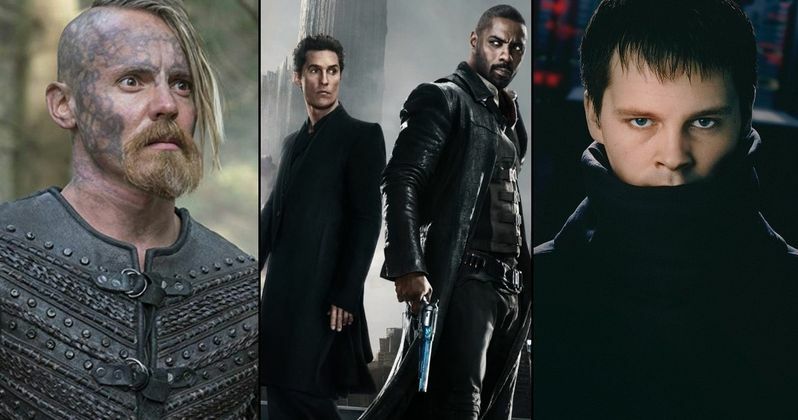 The Dark Tower TV series just became a very real thing. We initially learned that Amazon had landed the rights to the high-profile Stephen King project in February 2018, but things have been pretty quiet on that front ever since. Now we have word that Amazon is, at the very least, moving forward with a pilot for the show and they've cast their Gunslinger and Man in Black, with Sam Strike and Jasper Paakkonen set to play the two iconic Stephen King characters, respectively. According to a new report, Sam Strike will play Roland Deschain, aka The Gunslinger in the pilot, while Jasper Paakkonen will portray The Man in Black, aka Marten Broadcloak, aka Randall Flagg. Strike most recently appeared in SyFy's adaptation of George R.R. Martin's Nightflyers. Some of his other credits include Netflix's Mindhunter and NBC's Timeless. He's also set to star in HBO's Chernobyl series later this year. Paakkonen, meanwhile, was featured in Spike Lee's Oscar-winning BlacKkKlansman last year and he's going to reunite with Lee on his next project, Da 5 Bloods. The actor has also appeared in the series Vikings. Glen Mazzara, formerly of The Walking Dead, is set to serve as the executive producer and showrunner. This comes during a golden age of Stephen King adaptations on both the big and small screen. IT kicked that door wide open when it was met with widespread critical acclaim to go along with $700 million at the box office. Pet Sematary is coming down the pipeline shortly and also has been getting very strong buzz. Hulu has done quite well with Castle Rock and CBS All Access is working on a new adaptation of The Stand. The timing couldn't be better for Amazon to get in on the King business. Originally, the idea was to have this series tie into the 2017 movie version of The Dark Tower. Unfortunately, that didn't go over so well. The Nikolaj Arcel-directed adaptation currently boasts just a 16 percent approval rating on Rotten Tomatoes. The bad word of mouth also really damaged its box office potential, as it made a meger $113 million worldwide. As such, Idris Elba and Matthew McConaughey won't be returning as Roland and Randall. Instead, Amazon is going to take things in an entirely new, hopefully more faithful direction. The Dark Tower is one of Stephen King's most important works, comprising of eight books released between 1982 and 2004. With that much material, it makes way more sense to turn this into a TV series, rather than try to cram way too much into one movie. This also isn't the only high-profile (and probably very expensive) show that Amazon has in the works. They're also currently developing a Lord of the Rings TV series that will cost them more than a pretty penny to produce. But in the age of having to compete with Netflix and other companies like Disney, Apple and even Facebook, premium content is the only way to stay relevant. This news was previously reported by Variety.